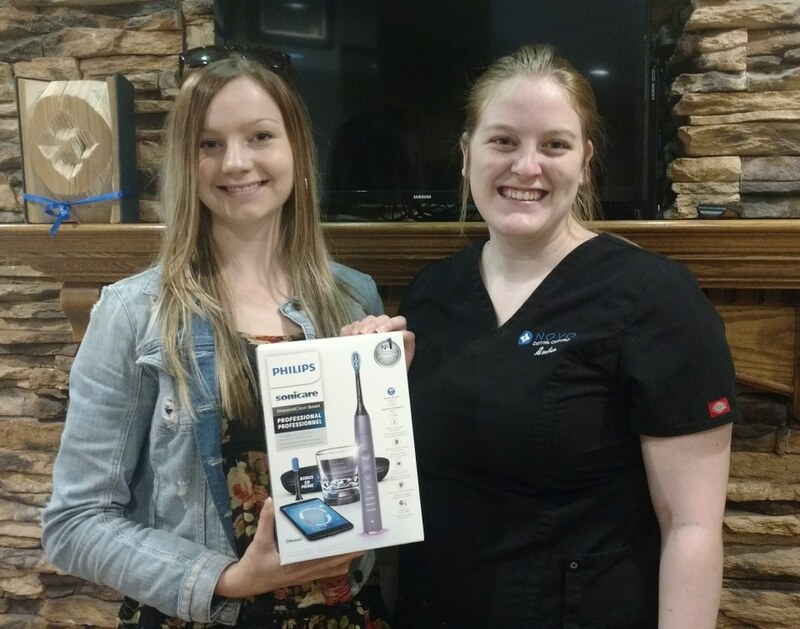 April is Dental Health Month and to emphasize the importance of good oral health we are happy to award Sophie Taylor this Month’s Draw Prize of a fabulous Phillips Diamond Clean, Sonicare toothbrush! She will be maintaining her lovely smile with the best tool in oral cleaning on the marketplace. The mouth serves as a “window” to the rest of the body, providing signals of general health disorders. Oral health is essential to one’s overall health and well-being at every stage of life. A healthy mouth ensures that not only nutrients are able to reach your physical body, but also enhances social interaction and promotes self-esteem and feelings of well-being. Recent studies have shown that micro-organisms (bacteria) from oral infections can enter the blood stream or airways and travel to other parts of the body. These micro-organisms have the potential to worsen or increase the risk for other types of health problems such as heart disease, stroke and respiratory disorders. Prevention is the key and there are amazing tools that will keep your mouth in tip top shape! Thousands of dental professionals worldwide recommend Philips Sonicare to their patients because Sonicare toothbrush technology produces a dynamic cleaning action that thoroughly cleans teeth and massages gums while still being remarkably gentle, even on sensitive teeth. It offers superior plaque removal, healthier gums and naturally whiter teeth by generating high-amplitude and high-frequency bristle motion, creating dynamic cleaning action that drives fluid deep into interproximal spaces and along the gum line. One of the features that is great with Sonicare is the blue reminder bristles on the brush head that show when the bristles are fatigued and losing their stiffness. This is important as the brush must maintain a certain amount of stiffness to effectively remove plaque. The brush heads snap on and off easily for replacement when needed. Sophie will enjoy a superior clean that she can see and feel.